In this work Weissbort is conducting one of his visual experiments: working with a limited number of colours but an immensely wide range of tones. 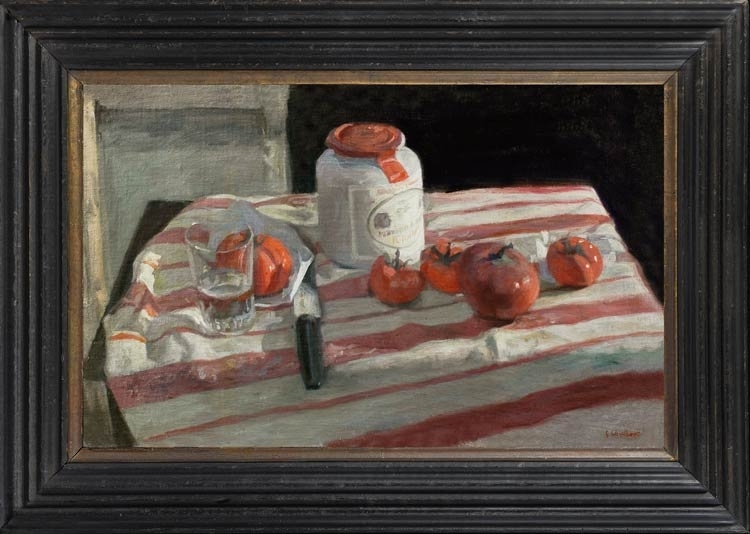 This painting is, like the Egyptian flag, composed from red, white and black, with tiny touches of green (in the tomato stalks) and gold (on the label) to lift and animate the composition. The result, however, is far from restrained; it resonates, zings and thrums with plangent, percussive life – the scarlet tomatoes both echoing and fighting against the cooler reddish pinks of the cloth, and the white areas of cloth (with their nacreous colour reflections) separating sharply from the whites of paper and jar. The viewpoint also helps to animate the scene; its slight elevation, together with the diagonal set of the table, gives an unsettling sense of movement, as though the surface were shifting and swaying. This is the influence of Cézanne again (cf. his Compotier with pitcher & fruit, Barnes Foundation); this is still life reimagined – contemporary artefacts updated, colours set against each other, harmony and peace shaken up, the contemplative spectator made to look with fresh eyes.